Caravan, motorhome and trailer tent customers who choose to go paperless and receive their insurance policies by email are helping us to raise thousands of pounds for charity. As part of our commitment to helping hearts, we donate £1 to Heart Research UK every time a customer opts for an emailed insurance policy rather than receiving their documents through the post. Throughout 2017, Caravan Guard’s Paperless Policies campaign raised a hearty £14,531. 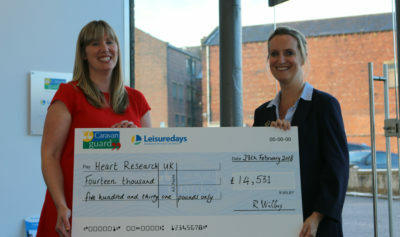 Our Associate Director, Laura Wilby, handed Heart Research UK a giant cheque and we celebrated with a Healthy Heart Day at our Halifax offices. Staff wore red and were treated to healthy snacks throughout the day. Plus, a Heart Research UK nurse carried out lifestyle checks. Caravan Guard’s Paperless Policies initiative has raised a massive £77,439 in the last nine years. Laura gave this year’s donation to Heart Research UK’s Chief Operating Officer Sam Turner and thanked customers and their staff for helping the company raise thousands of pounds once again. 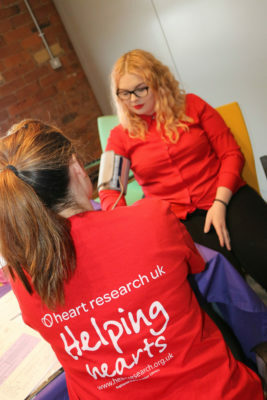 Barbara Harpham, Chief Executive at Heart Research UK, said she was so pleased that Caravan Guard and their customers had once again chosen to support Heart Research UK. Caravan Guard is committed to supporting a number of local and national charities to help make a difference to the lives of others.